In this Oct. 5, 2017 file photo, Department of Homeland Security personnel deliver supplies to Santa Ana community residents in the aftermath of Hurricane Maria in Guayama, Puerto Rico. 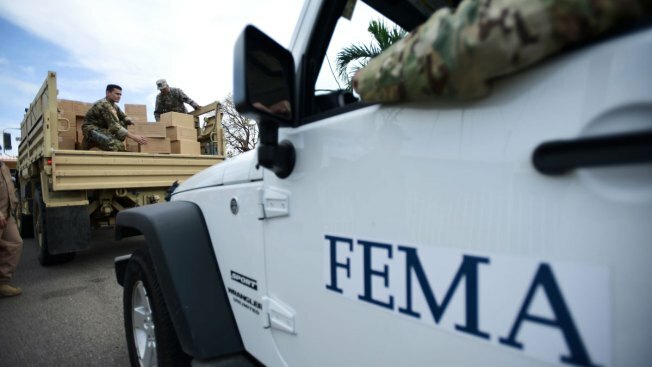 A new law requires the Federal Emergency Management Agency to investigate how it came to award Hurricane Maria relief contracts to a company with an unproven record. The Associated Press reported last year that the newly-formed contractor, Florida-based Bronze Star, LLC, won more than $30 million in FEMA contracts but never delivered the emergency tarps and plastic sheeting for repairs of damaged homes in Puerto Rico. Democrat Sean Maloney of New York proposed the legislation, which was included in the Federal Aviation Administration reauthorization bill, citing the AP's reporting. The provision passed both houses overwhelmingly and was signed into law by President Donald Trump on Friday. The Inspector General of the Homeland Security Department must begin an audit within 30 days and issue a report within 270 days.